It's hard for me to believe that April is gone already! Time for a peek at the May schedule on Turner Classic Movies. Orson Welles is the focus of the May Friday Night Spotlight, hosted by David Edelstein. There's also a special schedule of disaster movies the first three Thursday evenings of May. Below are just a few of this month's highlights; click on any hyperlinked title for the related review. ...May launches on the 1st with a lineup of "secretary" movies. 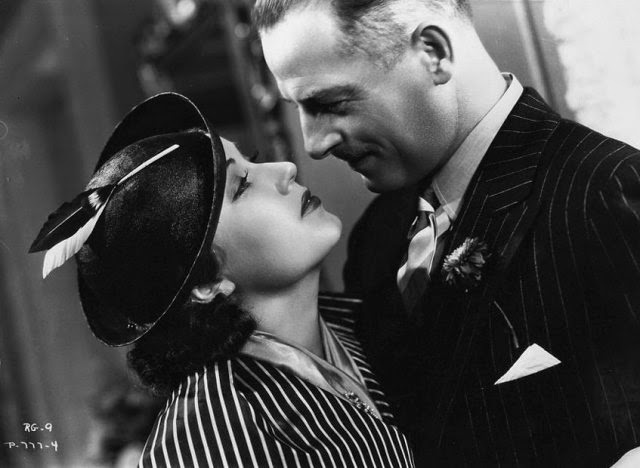 I'll be recording Jean Muir in HER HUSBAND'S SECRETARY (1937) which I've never seen. Other titles including the mind-bending pre-Code SHE HAD TO SAY YES (1933) starring Loretta Young; the delightful comedy THE RICHEST GIRL IN THE WORLD (1934) with Miriam Hopkins and Joel McCrea, not to mention sparkling support from Fay Wray and Reginald Denny; EVER SINCE EVE (1937) with Marion Davies and Robert Montgomery; and SHE'S GOT EVERYTHING (1938), an RKO charmer with Ann Sothern and Gene Raymond. A most enjoyable lineup! ...I just reviewed Greta Garbo in QUEEN CHRISTINA (1933), which I saw at the TCM Classic Film Festival. It's on this Saturday evening, May 2nd, as part of a Garbo tribute. 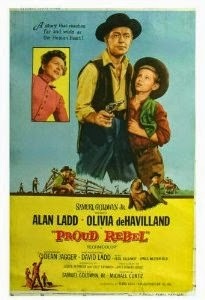 ...Don't miss Alan Ladd, Olivia de Havilland, and David Ladd in THE PROUD REBEL (1958) on Sunday, May 3rd. It's another film I saw at the recent TCM Classic Film Festival, and I hope to write about it in the near future. 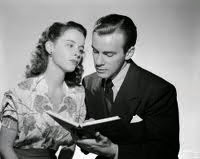 ...Fans of Susan Peters will want to check out THREE SONS O' GUNS (1941) on the 5th, costarring Wayne Morris. 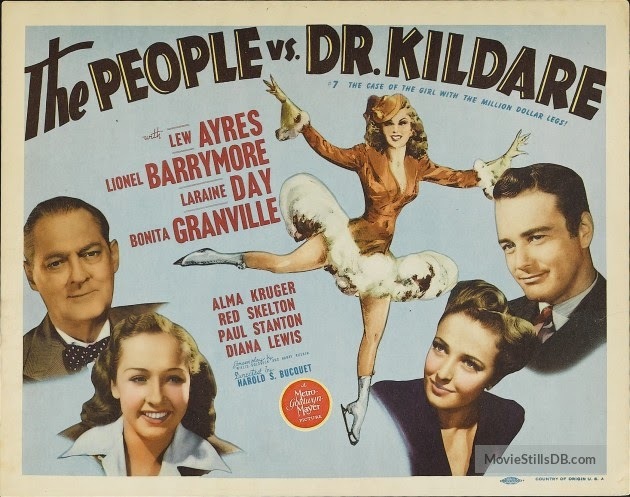 ...May 6th pays tribute to nurses with eight titles including Bebe Daniels as a REGISTERED NURSE (1934), costarring Lyle Talbot. Modern viewers may want to note the insane amount of smoking engaged in by the hospital medical staff! ...The month's first evening of disaster movies kicks off on May 7th with AIRPORT (1970), followed by some favorite air disaster films including THE CROWDED SKY (1960), FIVE CAME BACK (1939), and the terrifically fun SKYJACKED (1972). The shot of Charlton Heston piloting the plane during takeoff with a pipe clenched in his teeth is classic. Would he be fired for that in today's world?! ...Charlton Heston also stars in TOUCH OF EVIL (1958), which is part of the evening of Orson Welles films on May 8th. I can't say I really "got" TOUCH OF EVIL when I saw it at least year's TCM Festival, but the long uninterrupted opening shot is something every film fan should see. 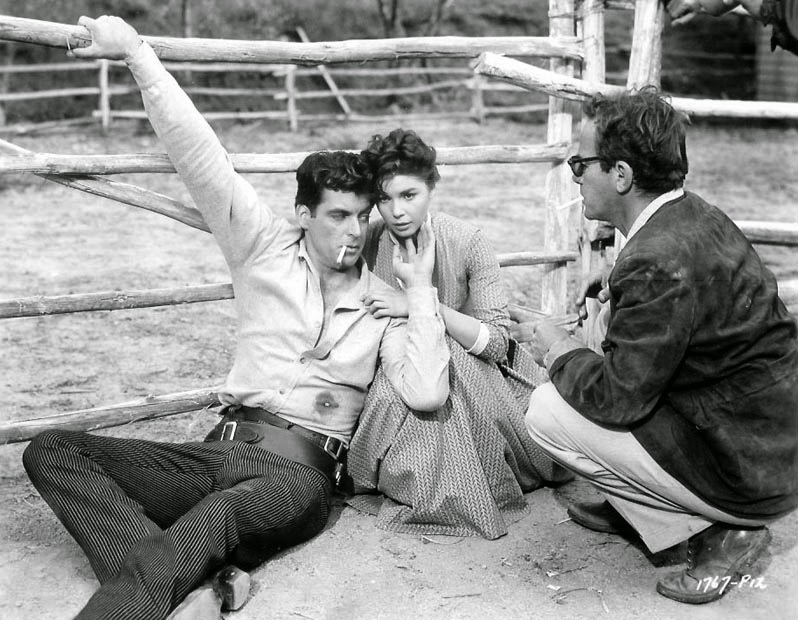 ...If you haven't seen it -- or even if you have -- sit down and watch RIO BRAVO (1959) on Saturday, the 9th. You'll be glad you did. John Wayne, Dean Martin, Ricky Nelson, Angie Dickinson, and Walter Brennan, not to mention Ward Bond and John Russell. That's entertainment! Directed by Howard Hawks. It was finally added to the Library of Congress National Film Registry last year. ...The Mother's Day films on May 10th include Lana Turner in IMITATION OF LIFE (1959), another film I saw at this year's TCM Classic Film Festival. It's an enjoyable melodrama directed by Douglas Sirk. ...May 13th is my favorite day on the schedule, an eight-film tribute to actress-singer Anne Jeffreys. Jeffreys, the widow of Robert Sterling, turned 92 in January. The titles include some interesting-looking obscurities such as SING YOUR WAY HOME (1945) and DING DONG WILLIAMS (1946) along with two films which have been reviewed here in the past, THOSE ENDEARING YOUNG CHARMS (1945) and TRAIL STREET (1947). ...More disaster films on the 14th! The titles include Charlton Heston in EARTHQUAKE (1974), which I found unfortunately bad, and SAN FRANCISCO (1936) with Clark Gable and Jeanette MacDonald, which is terrific. Also on the schedule: Tyrone Power in IN OLD CHICAGO (1938). 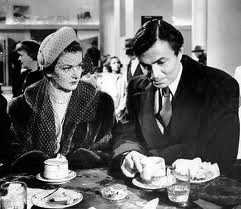 ...A tribute to James Mason on the 15th includes a film I adore, THE RECKLESS MOMENT (1948) costarring Joan Bennett. Death and blackmail in suburban Balboa Island, California. Bennett in particular was never better. This is a film which would also have been a great Mother's Day pick! ...This seems to be a month for TCM to show a number of the films from the TCM Fest! Another I loved seeing at the festival was CALAMITY JANE (1953), an old favorite with Doris Day and Howard Keel. It's on May 17th. 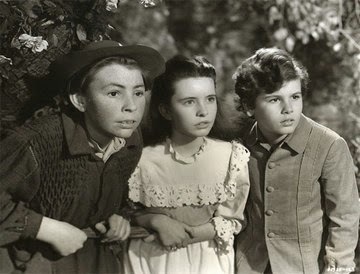 ...THE SECRET GARDEN (1949), starring Margaret O'Brien and Dean Stockwell, is one of the better film adaptations of a classic children's novel. It airs on May 19th. ...A day of early James Stewart films on May 20th includes a pair of films reviewed here quite recently, THE MURDER MAN (1935) and SPEED (1936). ...Eight Doris Day films air on May 21st. Sit down and enjoy!! 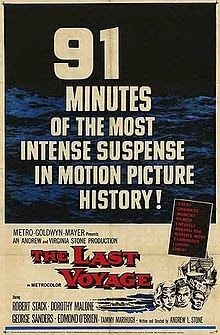 ...The disaster movies on May 21st include the nerve-wracking THE LAST VOYAGE (1960) with Robert Stack, Dorothy Malone, George Sanders, Edmond O'Brien, and Woody Strode. It has its flaws, including the casting of a child actress who was twice the age of her character, but it's a movie you won't forget. ...The annual Memorial Day Weekend marathon begins on Saturday, May 23rd, and continues through Monday the 25th. My pick of the weekend is the impressive THIRTY SECONDS OVER TOKYO (1944), with Spencer Tracy leading a huge cast including Van Johnson, Robert Mitchum, and Robert Walker. It's the very first war film airing on the 23rd. ...BELLE OF THE YUKON (1944) has a rather unusual cast: Randolph Scott, Gypsy Rose Lee and Dinah Shore. It's on May 26th. ...I love the "CSI" style film MYSTERY STREET (1950), airing on May 31st. 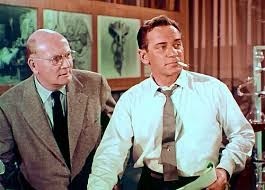 Police detective Ricardo Montalban and Harvard scientist Bruce Bennett try to solve a murder. For much more on TCM in May, please visit the schedule. Multitalented actor-director-writer Richard Carlson was born in Minnesota on April 29, 1912. 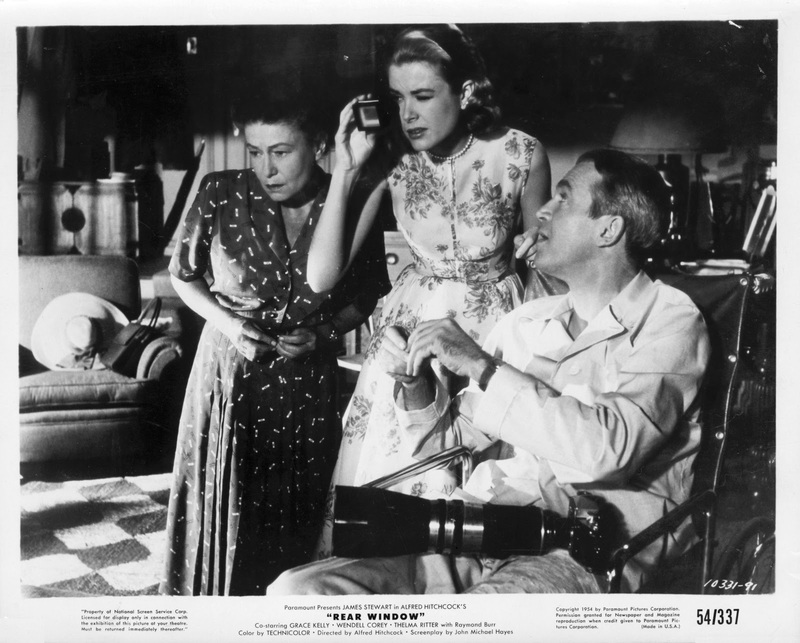 Carlson had a diverse and interesting career which spanned appearing in William Wyler's classic THE LITTLE FOXES (1941), playing a leading role in the searing TRY AND GET ME (1950), starring as Deborah Kerr's brother in the adventure classic KING SOLOMON'S MINES (1950), and appearing in Douglas Sirk's ALL I DESIRE (1953). Along the way he was the male lead in numerous very enjoyable minor films for studios such as MGM and RKO. More notably he became an iconic star of '50s sci-fi, appearing in films such as THE MAGNETIC MONSTER (1953), IT CAME FROM OUTER SPACE (1953), CREATURE FROM THE BLACK LAGOON (1954), and RIDERS TO THE STARS (1954). Simultaneously he starred on TV in I LED THREE LIVES from 1953 to 1956. He's seen above with Julie Adams in CREATURE FROM THE BLACK LAGOON. 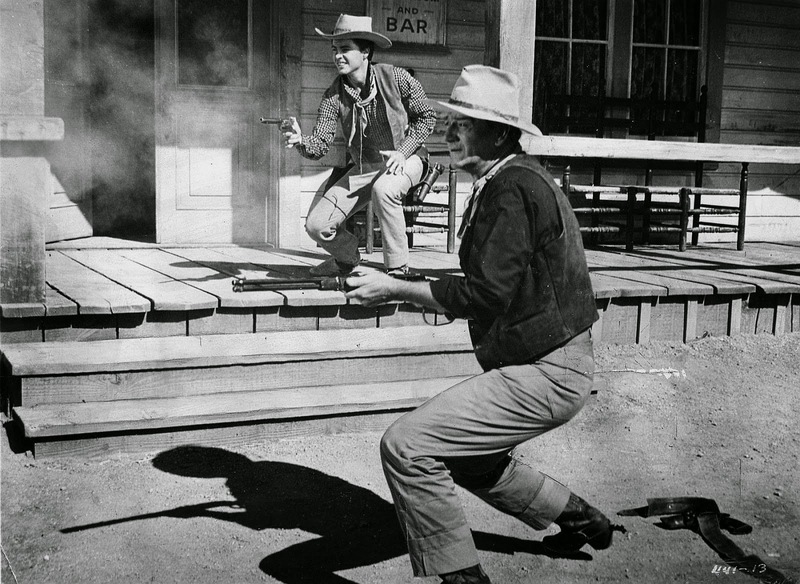 As the years went by Carlson worked behind the camera as a writer and director of both films and TV shows, with the lesser-known but very fine Universal Western FOUR GUNS TO THE BORDER (1954) a terrific example of his directing talent. 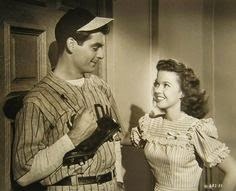 He's seen at the left directing Rory Calhoun and Colleen Miller. Carlson and his wife Mona had two sons; if I'm correct in making the connections, his son Richard Henry became an attorney in Northern California. 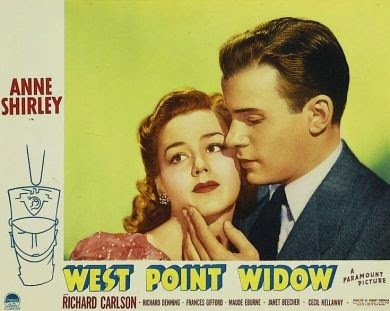 Richard Carlson films previously reviewed at Laura's Miscellaneous Musings: THE YOUNG IN HEART (1938), THESE GLAMOUR GIRLS (1939), DANCING CO-ED (1939), BEYOND TOMORROW (1940), THE GHOST BREAKERS (1940), WEST POINT WIDOW (1941), THE LITTLE FOXES (1941), FLY-BY-NIGHT (1942), HIGHWAYS BY NIGHT (1942), THE AFFAIRS OF MARTHA (1942), YOUNG IDEAS (1943), BEHIND LOCKED DOORS (1948), TRY AND GET ME (1950), A MILLIONAIRE FOR CHRISTY (1951), FLAT TOP (1952), ALL I DESIRE (1953), THE MAGNETIC MONSTER (1953), IT CAME FROM OUTER SPACE (1953), SEMINOLE (1953), CREATURE FROM THE BLACK LAGOON (1954), and RIDERS TO THE STARS (1954). Films directed by Richard Carlson which have been reviewed at Laura's Miscellaneous Musings: RIDERS TO THE STARS (1954), FOUR GUNS TO THE BORDER (1954), and APPOINTMENT WITH A SHADOW (1957). Other notable Richard Carlson films include THE HOWARDS OF VIRGINIA (1940), BACK STREET (1941), PRESENTING LILY MARS (1943), SO WELL REMEMBERED (1947), THE AMAZING MR. X (1948), THE BLUE VEIL (1951), RETREAT, HELL! (1952), and THE HELEN MORGAN STORY (1957), to name just a few. 2017 Update: Here are additional reviews of WINTER CARNIVAL (1939) and WHITE CARGO (1942), as well as new reviews of the DVD releases of DANCING CO-ED (1939) and TRY AND GET ME (1950). 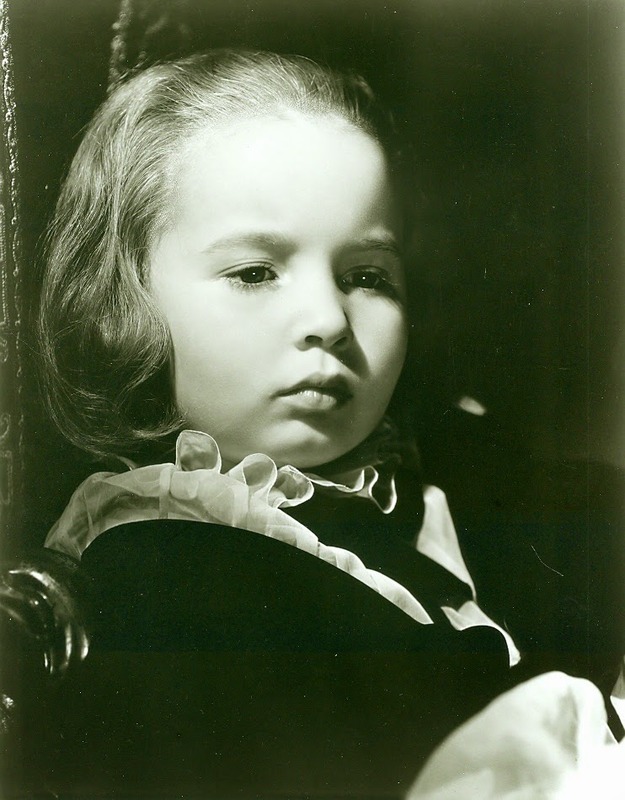 Earlier this year the Warner Archive released a trio of 1940s Shirley Temple films. 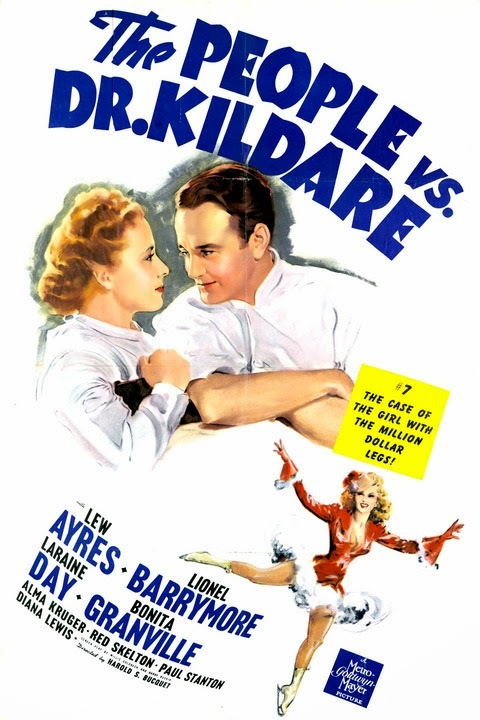 Two of those titles, KATHLEEN (1941) and HONEYMOON (1947), have previously been reviewed here, with the third, ADVENTURE IN BALTIMORE (1949), still to come. Having enjoyed two of these films, I also became interested in checking out a Temple film released by the Archive a while back, THAT HAGEN GIRL (1947). 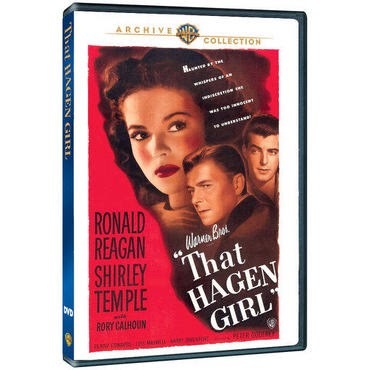 THAT HAGEN GIRL is a rather odd but absorbing film with a very interesting cast including Ronald Reagan, Rory Calhoun, and Lois Maxwell (aka "Moneypenny"). I enjoyed it. Shirley plays Mary Hagen, brought up by Minta and Jim Hagen (Dorothy Peterson and Charles Kemper) in the small town of Jordan, Ohio. Mary is lovely, sweet, and smart, but she's also the subject of gossip because Mrs. Hagen came home with Mary after visiting her sister in Chicago. It's widely suspected that Mary is the illegitimate daughter of attorney Tom Bates (Reagan), who left town shortly after Mary was born, and wealthy Grace Gately (Kyle MacDonnell). Although the gossips do their best to make Mary's life unpleasant, she's surrounded by supportive friends including her boyfriend Ken (Calhoun), her best friend Sharon (the always-bubbly Jean Porter), and her English teacher, Miss Kane (Maxwell). However, when Tom returns to town after an absence of 18 years, things start to go downhill for Mary quickly; the school board doesn't think it's appropriate for Mary to be the star of ROMEO AND JULIET, Ken's parents pressure him to marry a girl from the "right kind of family," Christine Delaney (Penny Edwards), instead of Mary, and Mary's mother becomes seriously ill. It's a very difficult time in the life of a young girl, but Tom and Miss Kane do their best to see Mary through the hardships. This was a rather fascinating film, in part as the stigma of possible illegitimacy is hard to fathom in this day and age, when the child obviously has nothing to do with her parentage. The movie is also a wild ride simply in terms of how the story evolves; it seems to be going one direction and then goes another. The film may not always know completely what story it wants to tell, but it's never dull. The movie reminds me a bit of GIRLS' DORMITORY (1936), when teacher Herbert Marshall seemed well-matched with peer Ruth Chatterton but ended up with young student Simone Simon. Here Temple and Calhoun seem well-matched agewise, with Maxwell and Reagan also being an appealing, age-appropriate pairing, but next thing you know the writers find excuses to break up both couples -- and it turns out Tom's been carrying a torch for Mary. Obviously, he isn't her father! Temple is lovely as Mary, and Maxwell is particularly charming as her forthright teacher. This was one of the Canadian actress's very first films. Reagan and Calhoun are both handsome, and Reagan is particularly winning as a man not given to caring what others think, unless it means Mary will be hurt. In addition to the cast members listed above, there are other interesting faces on hand including Conrad Janis (MORK AND MINDY), who had played a supporting role in another "coming of age" film, MARGIE (1946), the previous year. Harry Davenport has a single scene as Tom's mentor. Nella Walker, Moroni Olsen, Douglas Kennedy, Barbara Brown, Frank Conroy, and Kathryn Card are also in the cast. 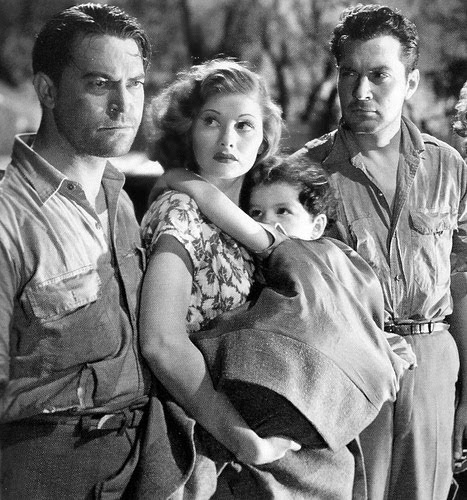 THAT HAGEN GIRL was directed by Peter Godfrey, who later directed Reagan in THE GIRL FROM JONES BEACH (1949). It was filmed in black and white by Karl Freund. Charles Hoffman's screenplay was based on a novel by Edith Roberts. The film runs 83 minutes. For the most part THAT HAGEN GIRL is a good print, although there are a couple brief scenes which are darker or spotted. The DVD includes the trailer. Thanks to the Warner Archive for providing a review copy of this DVD. Warner Archive releases are MOD (manufactured on demand) and may be ordered from the WBShop. 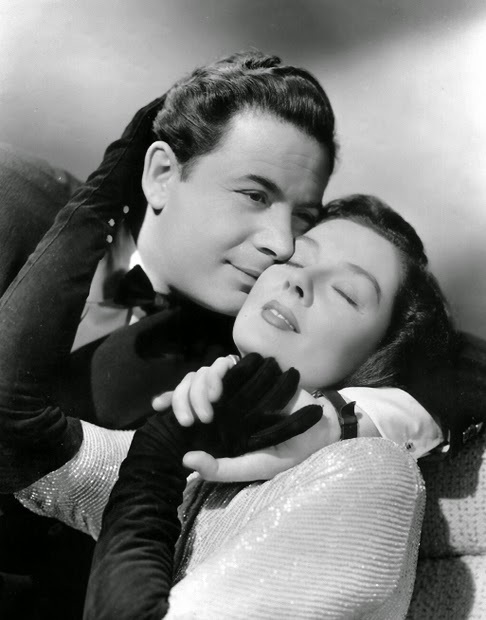 THE VELVET TOUCH (1948) is one of three Rosalind Russell films released this month by the Warner Archive. 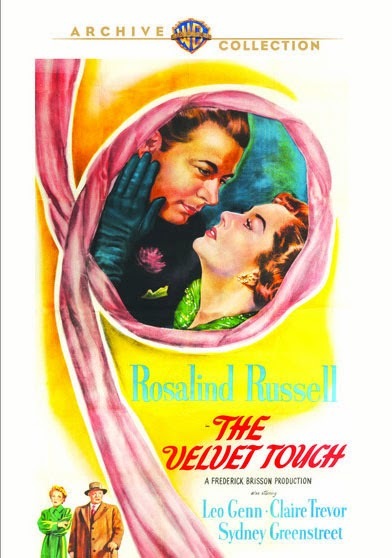 THE VELVET TOUCH is an interesting melding of crime story and psychological drama, with Russell starring as famed stage actress Valerie Stanton. On the closing night of Val's latest romantic comedy success, her longtime director-producer Gordon Dunning (Leon Ames) threatens to ruin her love affair with Michael Morrell (Leo Genn) if she insists on doing a serious drama with a new director. The verbal fight becomes a physical struggle, and Valerie picks up an award statuette off the desk and beans Dunning in the head, inadvertently killing him. Val flees the scene and actress Marian Webster (Claire Trevor), who has long loved Gordon from afar, finds the body. She picks up the statuette, putting her fingerprints on it, and she ends up suspected of the crime. Val suffers huge guilt over not confessing in the first place, especially when Marian collapses and is hospitalized. Val is ready to tell all to Captain Danbury (Sydney Greenstreet) when the distraught Marian kills herself, leading the police to close the case just as Val is ready to open in HEDDA GABLER. It's uncertain, though, whether Val will be able to go on -- and more importantly, whether she can live with herself if she never discloses the truth. Val probably could have made a pretty good case for self-defense if she'd just picked up the phone and called the police immediately, though she might have also ended up with a "heat of passion" manslaughter charge. She's hardly a cold-blooded murderess, and one can see a certain logic in Val's initial decisions, regretting it as a horrific fluke and just hoping it would all go away. Little does she realize just how heavily the guilt will start to wear away at her, even though the person implicated, Marian, has been an arch rival. Indeed, the fact she and Marian didn't get along seems to make Val feel worse about the situation, not better; as the saying goes, she wouldn't wish Marian's plight on her "worst enemy." 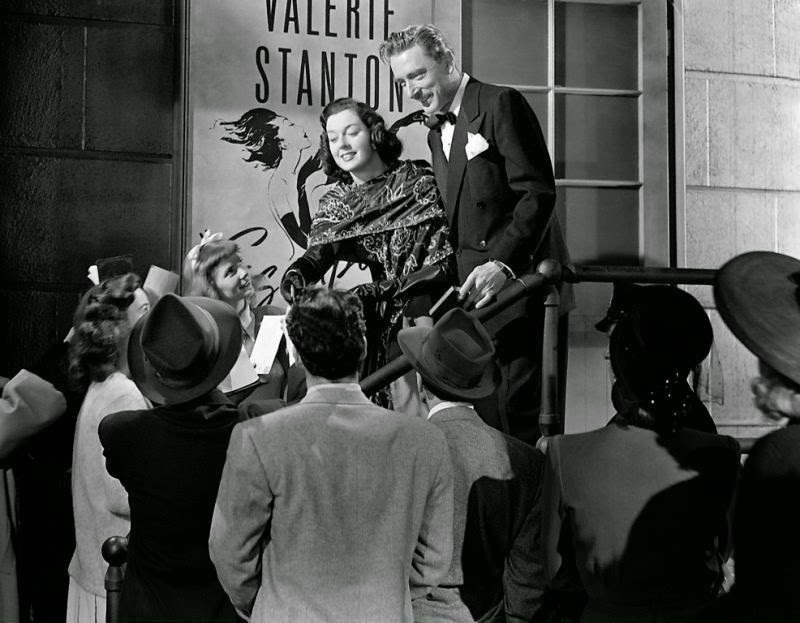 It's interesting that Russell's character, Val, achieved fame as a comedienne when Val's life is nothing but pure drama. Russell does a good job portraying the gradually building inner storm. There are interesting little touches to watch for, such as Val's penchant for wearing gloves, and the Travis Banton gown she wears prior to opening night is rather obviously covered in black X's! Greenstreet is terrific as the avuncular, theater-loving police detective; it's a role which somewhat calls to mind the psychologist he played in CONFLICT (1945). He's genuinely nice, but he also seems to have a pretty good instinct for who might have done it, as well as for the fact that she's not a criminal at heart, so he stays "in her face," killing her with kindness and hoping she'll eventually be motivated to do the right thing. Leo Genn is also quite good as Val's suitor, a powerful man in his own world (something to do with the then-new United Nations) who has the self-confidence to woo and handle a high-strung stage star. And like Captain Danbury, he's pretty sure Val had something to do with Gordon's death but loves her anyway. There are several nice smaller parts in the film for Theresa Harris (at right) as Val's loyal maid, Frank McHugh as the stage manager, Dan Tobin as a gossip columnist, and Lex Barker and Martha Hyer as young actors in Val's play. 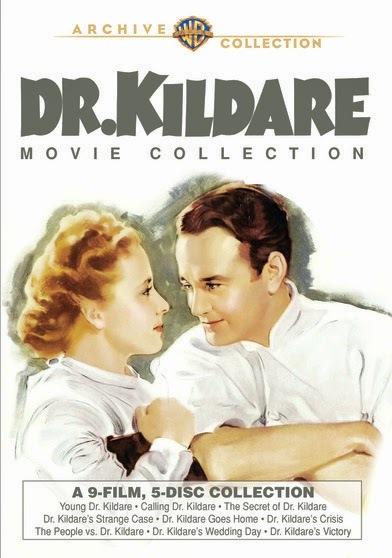 Walter Kingsford, Dr. Carew of the DR. KILDARE movie series, plays the director of HEDDA GABLER. Small roles are played by Nydia Westman, Russell Hicks, Irving Bacon, and Bill Erwin, with Queen of the Dress Extras Bess Flowers featured prominently in the closing night party sequence. THE VELVET TOUCH was produced by Russell's husband, Frederick Brisson, as an Independent Artists production, released by RKO. The movie was directed by John Gage and filmed in black and white by Joseph Walker. It runs 100 minutes. 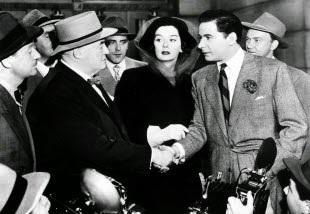 Fans of Rosalind Russell or '40s crime films will want to see this enjoyable movie. The Warner Archive DVD is a nice print. There are no extras. The first of the 16 films I saw at the 2015 TCM Classic Film Festival was QUEEN CHRISTINA (1933), shown in a sparkling 35mm print. Previously I'd only seen Garbo's last two films, the comedies NINOTCHKA (1939) and TWO-FACED WOMAN (1941). I've wanted to try more of her movies, and in fact I put her silent FLESH AND THE DEVIL (1927) on my list of 10 Classics to see for the first time in 2015. Seeing a Garbo film on the big screen was thus a wonderful opportunity. Garbo plays the titular queen of Sweden, who has adopted a rather mannish personality as she copes with ruling her country, international intrigue, and dealing forcefully with her many male courtiers. While traveling in the guise of a male, Christina meets an envoy from Spain, Don Antonio (John Gilbert) at an inn. She reveals herself to be a woman and they fall in love, spending a brief blissful time together. Political machinations in Sweden result in the people being turned against Christina's love for Antonio. Christina, tired of being the figurehead of a nation, determines she will abdicate in favor of a relative (Reginald Owen) and marry her love, but fate may intervene. I found watching QUEEN CHRISTINA to be an enjoyable and interesting experience, a very different type of film. While made with MGM's typical polished care, featuring a fine cast, the movie was completely dominated by Garbo and her star power. I wasn't quite sure what to make of Christina in the earlier scenes of the film, where she acts in such a "male" way that she refers to herself as a "bachelor" and gives her lady-in-waiting Ebba (Elizabeth Young) a lingering kiss on the lips. At the same time, while she was dressed as a man while traveling, it was a bit far-fetched that she was actually perceived as a male, but that's the movies for you. As Christina reveals her true inner self thanks to falling in love with Antonio, it becomes apparent that the male mannerisms have been a sort of protective outer shell to help fortify her as she leads a nation, standing up for herself amidst all the politics and diplomatic machinations. Love gives her the confidence to explore another side of her personality, and for the first time we begin to see her in beautiful gowns. 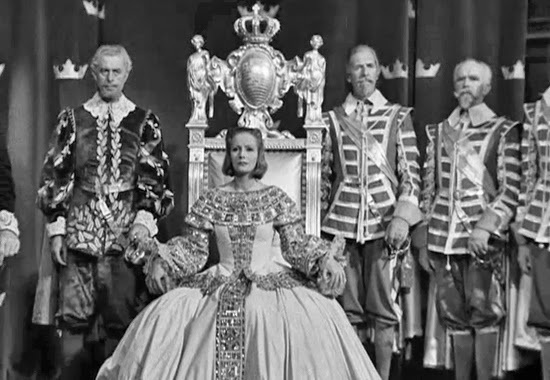 While Garbo's best-remembered scenes in this film are those where she walks around a room "memorizing" where her love affair began, and later her blank face as she sails away from Sweden in the film's final moments, for me the most powerful scene was when the peasants storm the palace. Garbo as Christina is quite remarkable as she refuses to cower behind bolted doors but insists on going out to meet her angry citizens, ultimately completely winning them over. I was also quite moved by the abdication scene, which was stunningly staged and acted. For me the film's one drawback was John Gilbert as Antonio. It's an old story that Gilbert had trouble transitioning from silent films to talkies because of his voice, and that aspect isn't true in the least; his voice was fine. I simply found him a little too goofy, even hammy, in a role I wished had been played by someone I found a little more dashing. Others I respect like Gilbert just fine, so like many things it may come down to personal taste, and he simply didn't work for me in the role. Cora Sue Collins, who plays Christina as a child (seen at right), appeared at an event at the Hollywood Roosevelt Hotel on the eve of the TCM Festival. I wish I'd seen her speak! A lovely woman, she just turned 88 on April 19th. Lewis Stone and Sir C. Aubrey Smith, who both always add so much to any film, are among the supporting cast. Also in the film are Ian Keith and David Torrence. 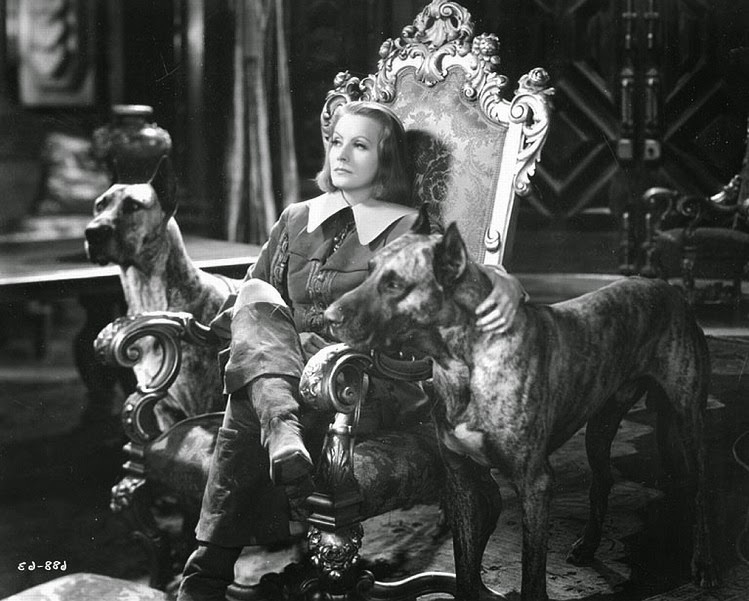 QUEEN CHRISTINA was directed by Rouben Mamoulian. It was filmed in black and white by William Daniels. It runs 99 minutes. 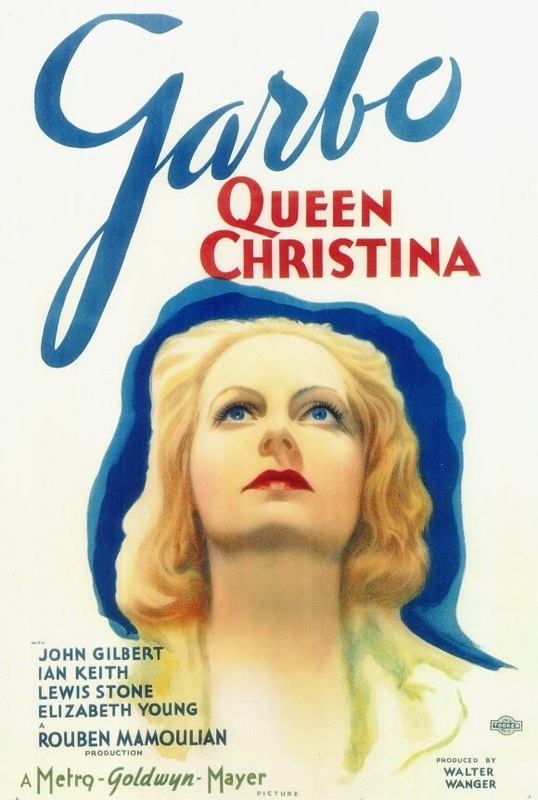 QUEEN CHRISTINA is available on DVD in the Greta Garbo Signature Collection. Having completed overviews of each day at the TCM Classic Film Festival, not to mention my coverage of the Noir City Film Festival, it's now time to turn attention to some of the individual TCMFF screenings I attended! First, though, here's a look back at a very special day which kicked off the week of TCM Fest fun. On March 22nd, the Sunday before the festival started, my husband and I spent a wonderful day exploring L.A. with Aurora and Annmarie, who had arrived in town early. It's always so much fun to see Aurora, and this year I was glad to have time to also get to know Annmarie better. I hope they had as much fun as we did! In a nice coincidence, we learned that morning via Twitter that March 22nd was the anniversary of James Stewart's 1941 induction into the U.S. Army, which can be read about in this L.A. Times article. That anniversary was wonderful timing, as our day ended up becoming something of a tribute to an actor we all dearly love (and who doesn't?!). We paid our respects at his hillside gravesite, then later in the day we attended the TCM/Fathom Events screening of his Hitchcock classic REAR WINDOW (1954) at Universal CityWalk. 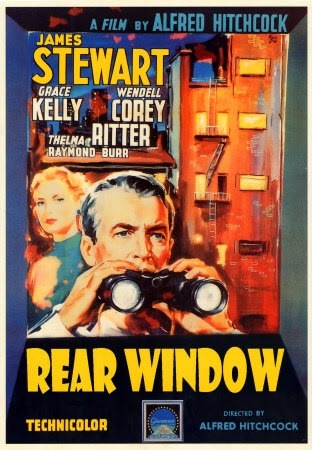 It had been at least a decade since I last saw REAR WINDOW, and I'd never seen it in a theater. 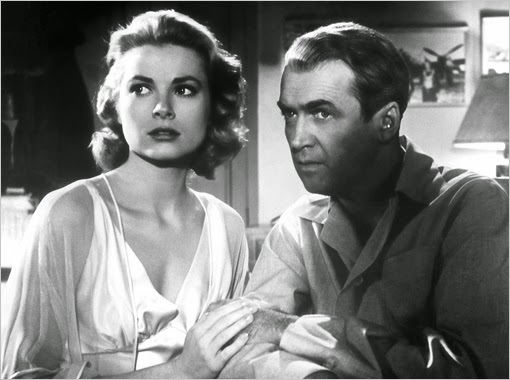 While I have liked REAR WINDOW well enough in the past, it hasn't been a particular Hitchcock favorite of mine, as it is for so many people. However, the experience of seeing it on a big screen in a beautiful print was so terrific that the movie moved considerably higher in my estimation. I was particularly delighted to realize that the John Michael Hayes script was based on a story by Cornell Woolrich, whose work has inspired so many wonderful film noir experiences of the last few years. Many classic film fans know the story well: Photographer Jeff Jefferies (Stewart) is laid up by a broken leg one hot summer, and he spends considerable time observing neighbors from the rear window of his apartment; when he's not people watching he's trying to convince himself his glamorous girlfriend Lisa (Grace Kelly) isn't cut out for life as a globe-trotting photographer's wife. 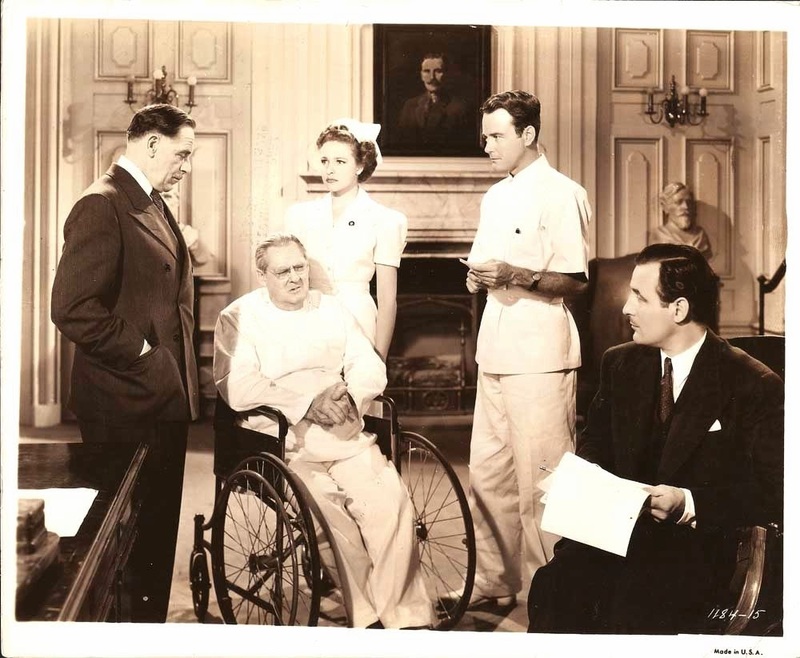 The monotony of his daily routine is also broken up by visits from Stella (Thelma Ritter), an insurance company nurse. Then Jeff notices mysterious goings-on with a neighbor, Lars Thorwald (Raymond Burr), across the courtyard...is it possible Thorwald murdered his wife? Lisa initially scoffs at the idea, then sees enough to convince her something strange is happening, and she goes to work with Jeff to investigate Mrs. Thorwald's disappearance. 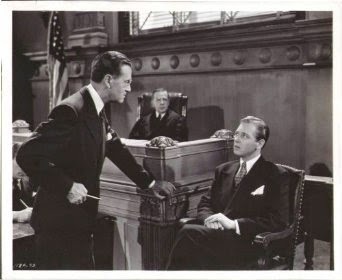 Jeff's police detective friend, Tom Doyle (Wendell Corey), remains a skeptic of Jeff's theory that Thorwald is a killer. 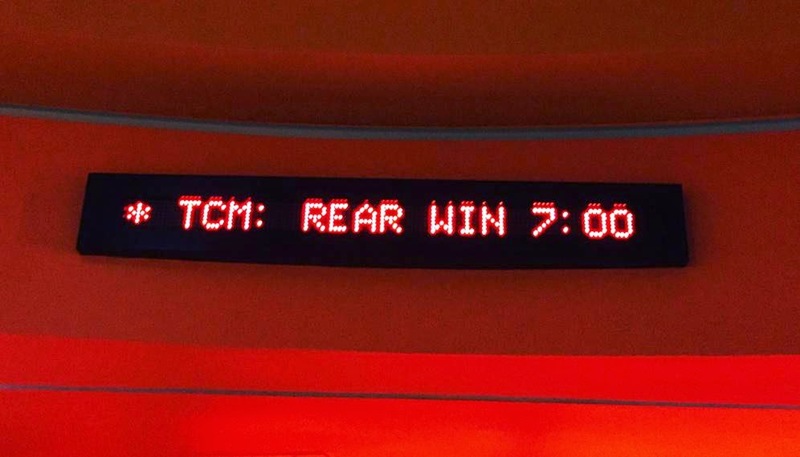 I had a really good experience with TCM's theatrical screening of another film from 1954, WHITE CHRISTMAS, and REAR WINDOW was another winner. The print was terrific, so crystal clear that every bead of sweat on Stewart's face could be clearly seen. The big screen also made the peeks in the various apartment windows much easier to appreciate. It's a perfectly paced suspense film, as bit by bit over the course of 112 minutes the evidence builds against Thorwald, with the nerve-wracking moments leavened by humor, particularly from the wisecracking Stella. Lisa proves herself to be quite the nervy investigator -- some of her actions are even a bit foolhardy, but her enthusiastic assistance can't help winning Jeff's admiration. And has there ever been a more unique method of fending off a bad guy than the wheelchair-bound Jeff uses in the climactic confrontation?! The movie is aided by its fantastic set design, photographed in deep focus by Robert Burks. The score by Franz Waxman and Grace Kelly's fabulous gowns by Edith Head are also key factors in the movie's success. I think the only thing I didn't like about the film, which perhaps also lessened my enthusiasm for the movie in the past, is Thorwald disposing of the neighbor's too-inquisitive dog. Of course, this sad incident makes any dog lover even happier at the prospect of Thorwald being caught. 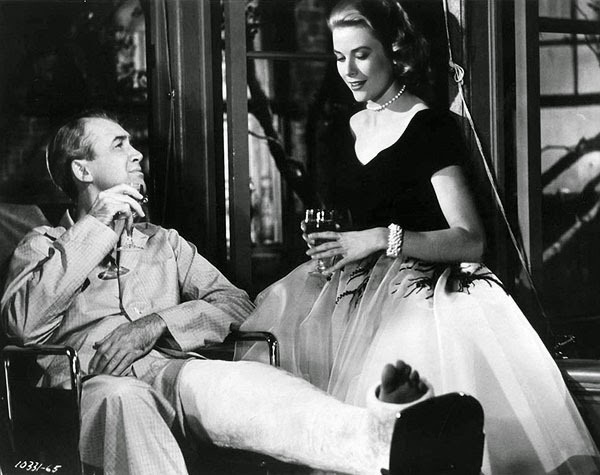 REAR WINDOW is available on DVD in multiple editions, and it's also out on Blu-ray. I'm not usually moved to upgrade films I've bought on DVD to Blu-ray, being quite happy with DVD quality, but this is one I'm inclined to consider, the better to enjoy it all over again on our big screen TV. Returning to thoughts on the very special man of the day -- thanks, Jimmy, for everything! And so, as Sunday night drew to a close, we finally came to the last movie of both the 17th Annual Noir City Film Festival and the evening's "Proto-Noir" marathon. SAFE IN HELL was the fourth film of the day, and the 20th film I saw in 10 visits to this year's Noir City festival. That number broke my previous record of 18 films seen at the 2012 festival! There were only two evenings I was unable to attend this year's festival. 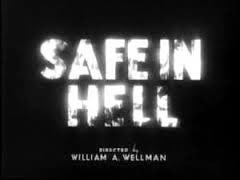 I had actually seen SAFE IN HELL, directed by William A. Wellman, at the 2013 TCM Classic Film Festival, although I use the term "seen" advisedly; although I remember William A. Wellman Jr.'s talk before the movie, I was tired that evening and at some point "zoned out" -- my eyes were open but I suddenly realized that the movie was about to end and I had no clue what was happening! I initially intended to revisit the movie on the Warner Archive DVD, but hearing quite some time ago that a William Wellman series was coming to UCLA, I decided to wait and see if I could watch it there. As it happened, SAFE IN HELL is not part of the Wellman series currently in progress at UCLA, but it turned up instead at Noir City! I stayed with SAFE IN HELL from start to the bitter end tonight, and wow, was that a bitter end indeed! SAFE IN HELL is one strange movie, almost like a nightmare put on film. Dorothy Mackaill plays Gilda, who has become a prostitute in order to survive. One night she fends a man off by hurling a bottle at him -- she knocks him cold but later the room catches fire and the police want to arrest her for his death. Gilda's sweetheart, a sailor named Carl (Donald Cook), returns from the sea just as Gilda needs to go on the lam; he forgives her her recent past and helps her escape to a Caribbean island where she cannot be extradited. Unable to find a priest, they marry themselves, but then he must return to sea while she remains in a hotel with a bunch of very sleazy characters who are also hiding out from the law. The money Carl sends Gilda is intercepted by the island's hangman (Morgan Wallace) and, well, the whole thing just gets weirder from there, with an ending that has to be seen to be believed. Mackaill gives an excellent performance, and it's a film which should be seen as an example of the pre-Code at its wildest, but I can't say I exactly enjoyed my 73 minutes spent with SAFE IN HELL, as it's both ugly and depressing. There are many pre-Codes where it's rather fun watching disreputable behavior -- I'm thinking of movies like RED-HEADED WOMAN (1932), BABY FACE (1933), and EMPLOYEES' ENTRANCE (1933) -- but SAFE IN HELL is unrelentingly dark and grim, with a jaw-dropping finale. 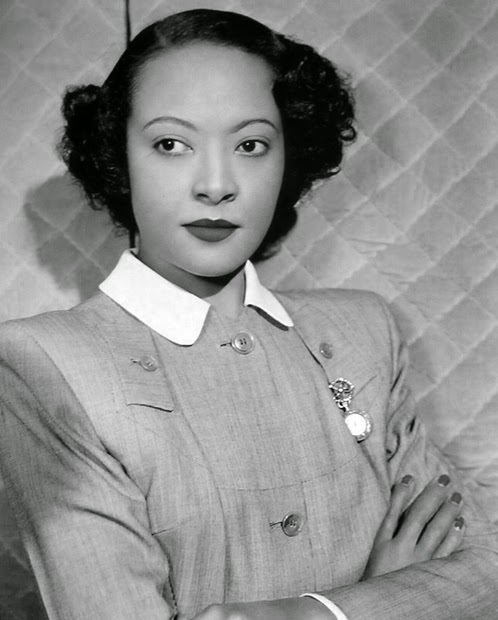 Nina Mae McKinney and Clarence Muse play hotel employees and are the most appealing supporting players. The cast also includes Ralf Harolde, John Wray, Ivan F. Simpson, and Charles Middleton. In closing, thanks to everyone at the Film Noir Foundation and the American Cinematheque for another great Noir City Festival!